The chapter draws from notions and experiences of kaitiakitanga (guardianship) in the context of a pūrākau (indigenous narrative) approach to understanding and developing a Kaupapa Māori conceptual framework. This approach acknowledges Mātauranga Māori (Maori bodies of knowledge) as the theoretical basis for Kaupapa Māori praxis, particularly in the field of health and social services. A pūrākau approach includes utilizing whakapapa kōrero (genealogical narratives) as it informs the use of traditional principles, beliefs, and practices (tikanga) in working alongside Māori whānau, hapū, and iwi. These purakau identify natural elements represented in the form of Ātua, or Gods. Through whakapapa (genealogical descent), Maori episteme positions tangata whenua within nature. 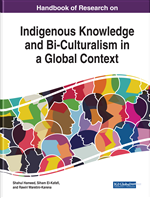 The indigenous worldview recognizes the inter-connected relationships, obligations, and responsibilities that underpin the philosophical positioning of kaitiaki practices. Maori Narratives or purakau include the people we engage with and our beliefs about ourselves within our cultural context. Māori developed beliefs about experiences based on whakapapa, (genealogy). Terry Dobbs and Moana Eruera (2010) state that whakapapa is often referred to as the foundation of Maori world-view (p.12). Dr Rāpata Wiri (2013) also discusses whakapapa as being the central framework of Māori epistemology (p.6-8). Post-modernist theory stipulates social constructionism as the theory, which supports why we as a society of people develop beliefs about our experiences. This is often because of what is, or has been socially constructed. Boghossian (2005) states that both the abstract thought that some things are created by societies, and the thought that some beliefs owe more to social values than they do to the evidence in their favour, are as old as reason itself (p.2). Storytelling is a format for articulating and delivering knowledge generated through observation, experience and understanding. For indigenous communities, storytelling is an approach to articulating and understanding cultural values, beliefs, worldviews and understandings. The objective of storytelling is to utilise metaphors, which illustrate multiple ways of knowing, understanding and perceiving the world around us.